Thank you for visiting Midnight Rosewater! We hope to use this blog as a platform for sharing our experience, knowledge, and love of food with you. In our first post ever, we would like to give you a brief overview of the structure and the philosophy of this blog. That way, you may understand our reasons for creating it and the kind of posts you can expect. Without further adieu, let's jump right into it! Midnight Rosewater has two components: education and review. The main goal for this blog is about food education. In this component of this blog, we want to offer you useful and interesting information about certain food items and ingredients that aren't normally part of the American diet. Under the #LEARNABOUT menu (or, the "#LEARNABOUT" label), we highlight one food ingredient per issue, which could either be a spice, produce, or even a cooking technique. We teach you about the science, history, nutrition, or anything that we find interesting about this featured food item. So it's like an encyclopedia about food, except much more fun! Under the CHEF SAYS menu, we will periodically interview local chefs from the Twin Cities area, as well as our friends who are GREAT cooks, and have them teach you about the secret ingredients from their cookbook. 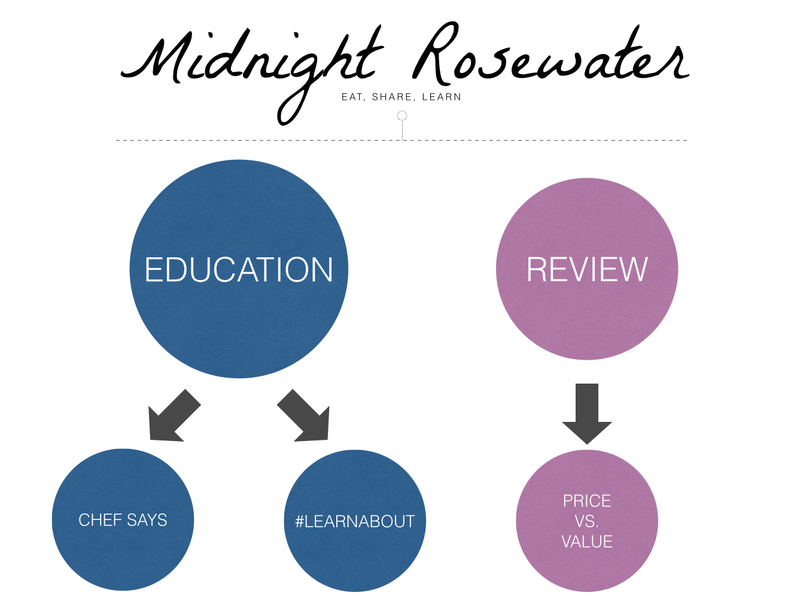 The review section serves as a bonus for this blog, as Midnight Rosewater is mainly a food education blog instead of restaurant review. However, once in a while there will be an article or two highlighting an unforgettable experience that we had at a restaurant, and maybe tell you about the unusual ingredient they used to achieve perfection. Another bonus for you: under the PRICE VS. VALUE menu, we present an interactive scatter plot as well some tables. Here, we've critiqued some restaurants, and rated their value (based on our overall impression) versus the average price you pay for dining there. Hopefully this section will give you some starters' guidance to dining at restaurants around the Twin Cities area. Make sure to check it out! Unlike most food blogs, we aren't a recipe-oriented blog (although it's not to say that we don't have some killer recipes of our own). The reason for this is that we would rather teach you about the most fundamental building blocks of any recipe: the food and ingredients themselves. This way, you can invent your own recipes using the knowledge you have learned! So next time when you go to a farmer's market, you don't have to shy away from trying new "veges of unknown origins", because you learned about them from us! Regardless of how you found us, we would like to thank you for visiting Midnight Rosewater. Please keep checking back regularly!